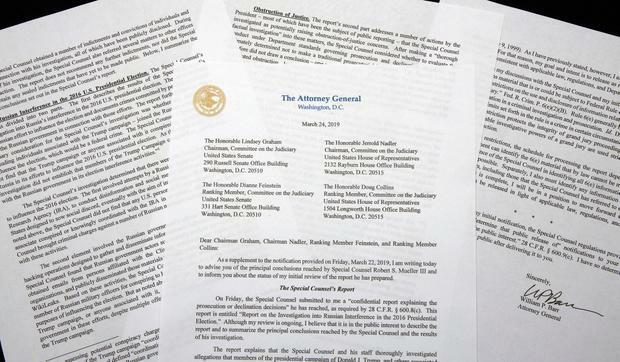 Attorney General William Barr released his letter setting forth the principal conclusions relating to the Russia probe conducted by special counsel Robert Mueller. It does not say whether Mueller found that President Donald Trump lied to the American people. It does not say why there were more than 100 contacts between the Trump presidential campaign and transition team and Russia-linked operatives, or why so many people denied that there were contacts. The report does not say whether Trump and his associates welcomed the help of a foreign hostile power. It does not say anything about possible state prosecutions. :: There were two main Russian efforts, one primarily through social media, and the other via email hacks disseminated through intermediaries such as WikiLeaks, to interfere with the election. If we accept Mueller's investigation, the claim that there is uncertainty about who interfered with the election and on whose behalf is false. :: Mueller did not find that Trump or those with his campaign conspired or coordinated with Russia to interfere with the election. :: Mueller found a list of actions under the part of his investigation into obstruction of justice but did not reach a prosecutorial decision. Mueller explicitly did not exonerate Trump of obstruction. Trump's appointed attorney general and Deputy Attorney General Rod Rosenstein decided it was not sufficient to establish that an obstruction-of-justice offence occurred. :: What was the series of actions that Mueller looked at when investigating obstruction? :: Why did Mueller decide not to opine one way or the other on obstruction? :: Did he find a preponderance of evidence of obstruction? :: Why did Barr and Rosenstein conclude there was no obstruction-of-justice crime? :: Did Mueller not find evidence of coordination/conspiracy, or did he rule it out (disprove it)? :: What explains all the Russian contacts? :: What financial incentives, if any, did Trump have to favour Russia? :: Did the Russian government attempt to cultivate Trump as an asset or have leverage over him? :: Why did Michael Flynn lie about Russia contacts? :: Why did the president wait so long to fire Flynn? :: Did any of Trump's family members or associates lie to Congress, and if so, why is there as yet no indictment?